SEO has become an integral part of every digital marketing plan. Let’s keep it real – if you run a website, you’d like to make a profit from it. And since any online activity boils down to revenue and gains, SEO has already proved itself as the best profit-yielding channel in terms of ROI. But don’t perish the thought to get juicy ROI of your SEO efforts overnight. Take your time, properly allocate your budget, and wait for the first results to come only in 6-12 months. Practically, it’s difficult to figure out an exact time frame for your SEO campaign. Prior research and competitor analysis is an absolute must if you want to forecast your SEO results. 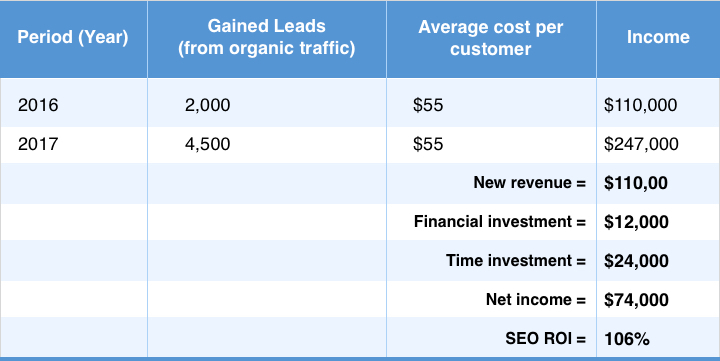 Before we reveal the preliminary calculation of ROI of your SEO, let’s clear up some basic notions. When it comes to investments in digital marketing channels, 8 out of 10 website owners would prefer to get their money back with a decent surplus within the shortest period possible. No wonder that paid marketing channels like Adwords and AdSense usually look more seductive than SEO that generates the first income at the earliest in 6-12 months. Definitely, the biggest advantage of paid marketing channels is that if you lay your money out today, you’ll get a revenue not later than tomorrow. It means that you can instantly boost your traffic if your marketing and sales processes are well-done and run smoothly. Unlike paid marketing channels, SEO is an investment-based marketing channel. However the comparison is pretty obvious, but SEO is like an apple tree. If you want to secure a heavy crop of apples, you’ll have to grow, water, and debug the plant with all the loving care. The very same with SEO activity. If you want to reap the benefits of SEO, you’ll have to invest first. The bright side is that the benefits of SEO scale exponentially over time. That means that every piece of content you create, every backlink you acquire will provide you with a long-lasting, increasing value for your website in terms of traffic, sales, and authority. Here’s an illustration that vividly depicts the difference between SEO and paid marketing channels. Don’t forget that 1st-page websites require constant maintenance. Websites won’t keep the leader positions just for a good reputation. They ought to keep up, optimize, develop engaging content and look for the top-notch tactics to stay on Google’s Top. Before pouring cash into your SEO campaign in pleasurable anticipation of three or four digit ROI, you’ll have to figure out that there are 2 types of SEO investments. And each of them is considered when calculating the ROI. Financial investment. This is exactly the amount of money you spend on your website advancement. These funds may be spent on backlinks purchase, content creation, fixing of on-page issues, and SEO tools that help you automatically monitor and adjust your ongoing SEO campaign. Time investment. This type of investment is often overlooked. Though, it doesn’t become less important. Basically, time investment means the timeframe for implementing all the steps of SEO campaign to pop up on the front Google’s page. Plus, you have to include here the hourly rate of your SEO agency or SEO professional. You must keep track of your time investment in order to understand whether an SEO is a good channel for your business. By assessing your financial investments & time investments, you’ll get a full picture of your SEO campaign effectiveness. 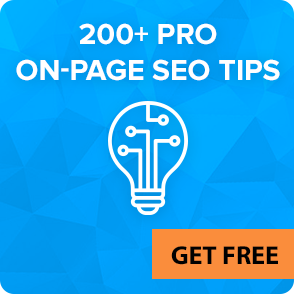 And now, we’ll show you how to calculate your SEO ROI. Let assume that your financial investment in SEO amounts to $1,000/mo. These funds may be spent on content creation, backlinks purchase, and whatever you need within your specific campaign. Then, let’s consider your time investment, that is an hourly rate of your employees or SEO agency. Let’s take an average $100/hr. Suppose, you’d spend 20 hours/mo on your SEO. It implies that in case you invest $36,000/year in your SEO, you might get $110,000 in revenue. Once again, it’s crucial to monitor and evaluate the performance of your SEO over a long haul. Still, keep in mind that this is an example of a lead-based business with a particularly great SEO campaign. Remember that SEO differs from other marketing channels, and if you want to see the great results, you have to be ready for high upfront investments. Our sales manager Karin Foster has lots of stories about customers’ success and failure. One of the cases we want to describe is when a customer, let it be John [the name is fictional since our customer wished to be unnamed], has been using LinksManagement services for just 2 or 3 months, and he was eager to see the long-awaited results. But no progression was there. And John wrote that he was about to leave us and stop all the link building routine and SEO in whole. And rightly so, John saw the first results within the following 8 months. Also, it has to be considered that John was investing $1000/mo in his SEO campaign. Despite the fact that the total expenditures were huge in the first 8 months of the SEO campaign, John kept his eyes on the prize. Eventually, all his costs paid off in spades. 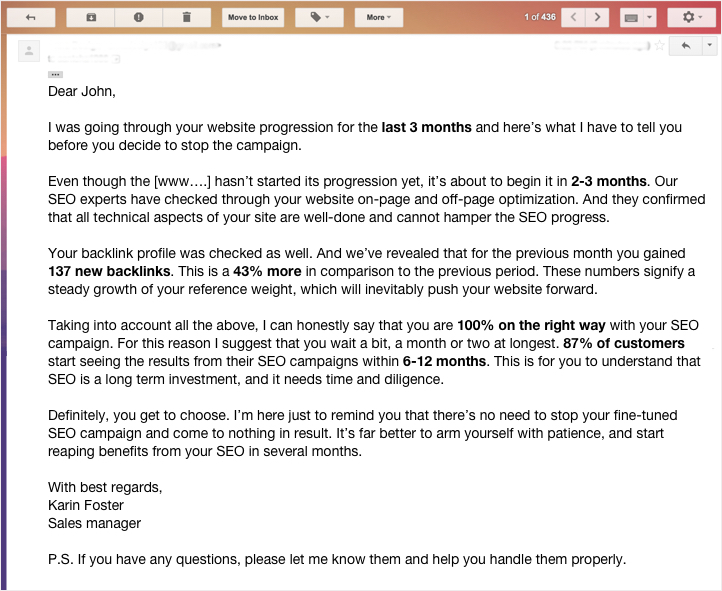 But let’s start with the very beginning and live through each month of John’s SEO journey. As we remember, John wasn’t satisfied with a zero result in the first 3 months with LinksManagement. Well then, this is actually the integral part of any SEO campaign. 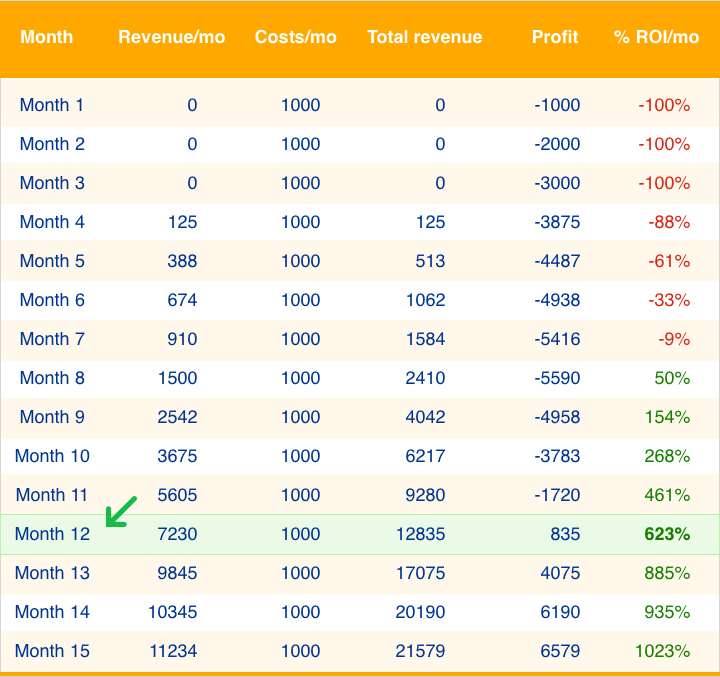 Luckily for John that he successfully survived these first months of deliberate zero revenue, and went on with his optimization. This is the first month that brought in a difference. 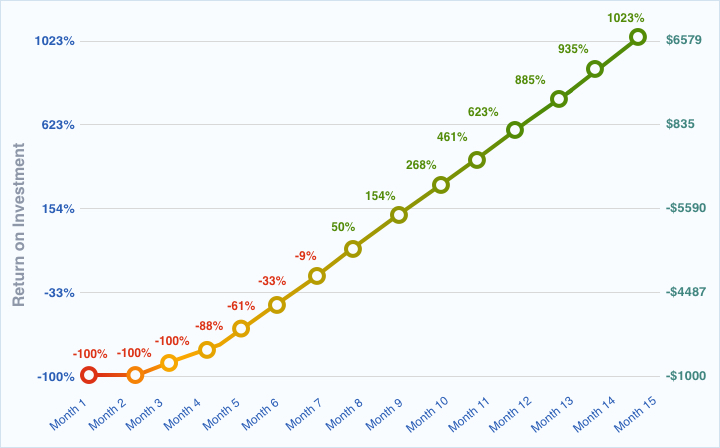 John’s backlink mass went up by 43% in comparison to the previous period, and the first revenue was there – $125. 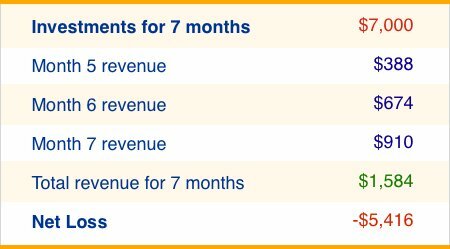 By month 7, John’s total revenue was $1,584. On the spot, it’s 7 months in, and ROI was still negative. After an initial investment of $7,000, all we had was an impressive loss of -$-5,416! Doesn’t sound too inspiring, does it? But once again, everything was working as it should. No need to panic. That was it, the breaking point when John finally saw that his investments paid off completely and even brought him an extra $835. From that moment on, John’s website shot upwards and start bringing an ever-increasing revenue. That was the best proof that all those $1,000 monthly investments and stubborn SEO efforts were not in vain. 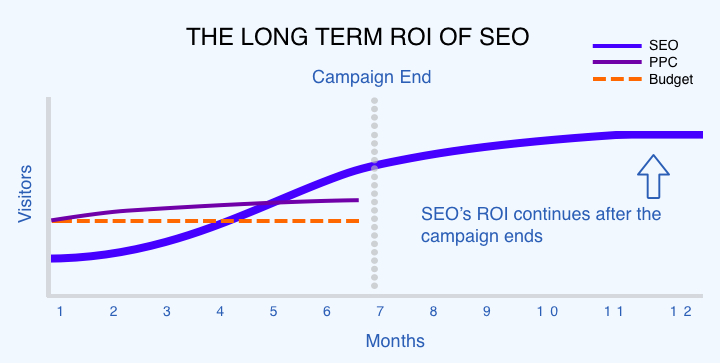 After a single year of proper SEO campaign, your total ROI may result in 623%. Isn’t that the revenue you are dreaming of? With moderate upfront costs, you can get x5 higher profit. 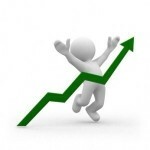 Typically, a 15% ROI in a year for any business is great. Such ROI signifies that investors and everyone involved in the business promotion have performed well. In the case of SEO, one has to think twice about the overall SEO campaign in order to end up with exponentially increasing ROI. If you stick to the original lofty SEO plan, trying to look ahead and predicting the outcome of your actions, you’ll reveal that the potential growth of ROI is limitless. Is SEO a good investment? Considering the data above, it’s exceptionally hard to argue otherwise. Start investing in your SEO today to watch your income blowing up! Finally, we would be glad to hear your stories about how you managed to get the ROI of your SEO.